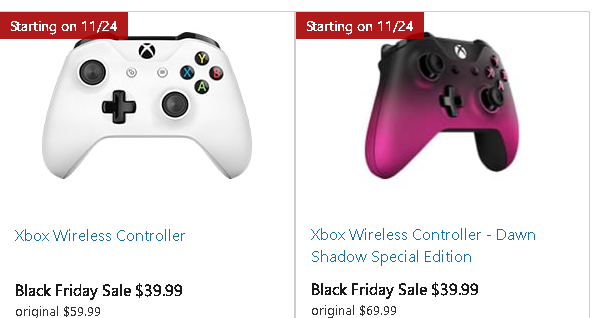 With a little over a week left until Black Friday, Microsoft has released its sales lineup on the Microsoft Store. Similar to other companies’ online marketplaces customers will pick up deals on Microsoft goods and content that can be used on the company’s products. Deals that stand out include price drops on Xbox One games up to the 50-percent, three months of Xbox Live for $14.99, and Xbox One controllers drop $30 to $39.99 for multiple colors. The biggest deal with Xbox One comes with a $50 drop to pick up the console at $249.99, a $25 gift code, and a free game—because what’s a brand new console without at least one game to enjoy on it? Those deals kick off on Thanksgiving. Other deals include a Roku for $39.99 (dropping $10)—which kicks off on the 20th—and a lot of deals for PCs. The deals that stand out will see customers pick up an Alienware 15 Touch Signature Edition gaming laptop for $1,497 with a huge price drop of around $1,000. If you want VR headsets, Microsoft is offering both the HTC VIVE and the Oculus Rift at full price, but the company is throwing in a $100 gift code as well. On November 20th customers can pick up a Surface Pro 4 for $799, saving $200 and on Thanksgiving they can save $400 on a Surface Book for $1,499. The deals listed are just a sampler of what Microsoft plans to offer, so be on the lookout for Store-wide sales between the 20th and the 24th.